The Intellicare™ Hybrid dispensing system covers a variety of needs, dispensing both foam hand care soaps and hand sanitizers. Sleek, attractive hybrid dispenser provides additional functionality, switching easily from a touchless dispenser to a manual if the battery dies before replacement. 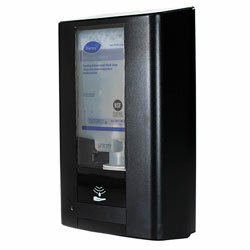 Dispenses 1300mL bottles of hand soap and 1200mL of alcohol-based hand sanitizer. Can dispense 0.4 mL or 1.00 mL per push. Locking dispenser resists tampering, while a translucent window allows for easy product visibility. Near-empty product alarm and low battery signal make it easy to know when a refill or a fresh battery is needed. Dispenser Type: For Liquids/Foam; Capacity (Volume): 1200 mL; 1300 mL; Holds: 1300mL Bottles of Hand Soap; 1200mL of Alcohol-Based Hand Sanitizer; Color(s): Black. Black Soap Dispensers from Diversey! 1496 In Stock today.